South Dakota: Under God the people rule. South Dakota was the fourth and final new state of my Big Bear Lake road trip, and number forty-five overall for me. I had a rather ambitious day planned: starting in Cheyenne, Wyoming, I would head up to Deadwood, then go south to Mount Rushmore, and then east to Wall Drug before ending up in Pierre. I got to Newcastle, Wyoming, and during lunch there I decided that there would not be enough time to get all that done and still end up in Pierre before dark. So I skipped Deadwood and went east from Newcastle into South Dakota. Wall Drug is a tourist trap, one in which I was ensnared entirely willingly, that rivals perhaps only South Carolina's South of the Border in terms of the number of billboards. It started as a mom and pop operation in the early 1930s by Ted and Dorothy Hustead, and business was tight. Nearing their self-imposed five-year deadline for making the place of success, the Mount Rushmore National Memorial soon opened about sixty miles to the west. Thinking that this would create a stream of cars passing their drugstore, they soon hit on an idea to attract business. They figured that the tourists would be extremely hot crossing the prairie in the summer, so one day Ted went out about forty miles and put up billboards advertising free ice water. By the time he got back, there was a line of customers waiting, and the rest is history. Today there's a huge cafe, gift shop, and a whole bunch of stuff that can very conveniently be characterized as "Americana." I had three cups of ice water, and three cups of five-cent coffee. This picture was taken on US-16, which is known locally as Mount Rushmore Road. I spent about 20 minutes looking at various online mapping sites to find out in just which town exactly this picture was taken. But I guess it was just in some unincorporated part of the county. 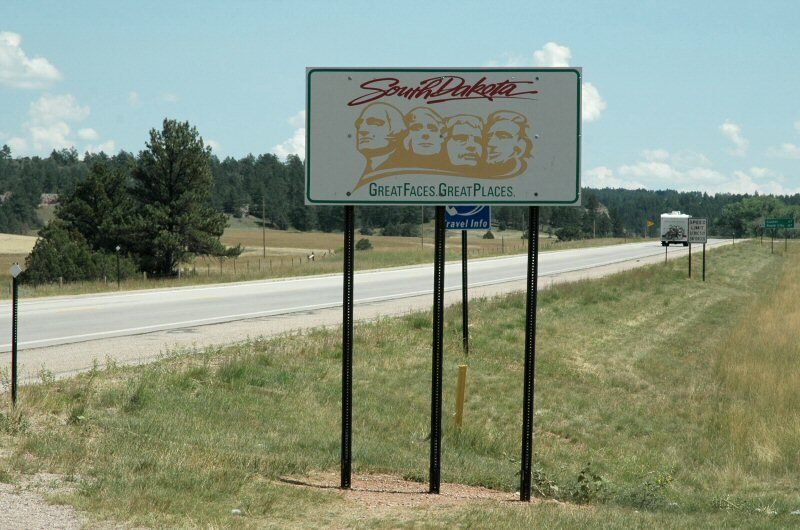 South Dakota seems to have one standard welcome sign, differing only in size. Being a two-lane US highway, this state line crossing merited only the small one. That "Great Faces Great Places" logo is pretty ubiquitous; I even saw it printed on the soap dispenser in the men's room of a rest area on I-90. The road to Mount Rushmore is pretty as you go through the Black Hills. Pine trees, lakes, and sheer rock faces abound. As you move farther east through the state, South Dakota becomes pretty much what I expected: miles and miles of grassland, in my case parched brown by the August sun. No reflection on the people of the fortieth state (or is it thirty-ninth? 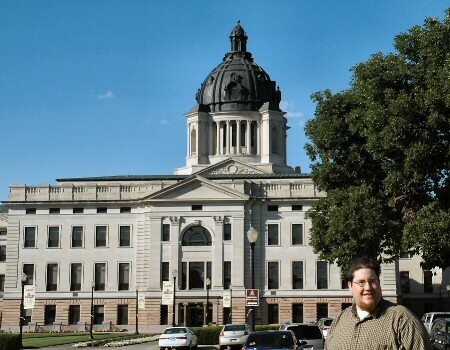 ), but it was during my time in South Dakota that I first started to get tired of the road trip. 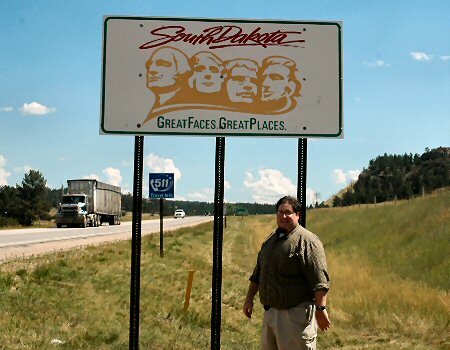 South Dakota is traditionally our 40th state. So the story goes, the bills for statehood for North Dakota and South Dakota were presented together to President Benjamin Harrison in November 1889. Apparently his desk was a little cluttered that day, so it remains a mystery which one actually got signed first. Since South Dakota comes last alphabetically, they gave North Dakota state number thirty-nine and South Dakota state number forty. This page loaded in 2.705 milliseconds.